The U.S. dollar had strong gains against various major currencies in 2016. Clarity surrounding the Fed’s decision to start raising rates along with anticipated growth expectations from Trump’s policies have catapulted the dollar. Both the anticipation of higher rates and a growing economy can help send currencies higher. 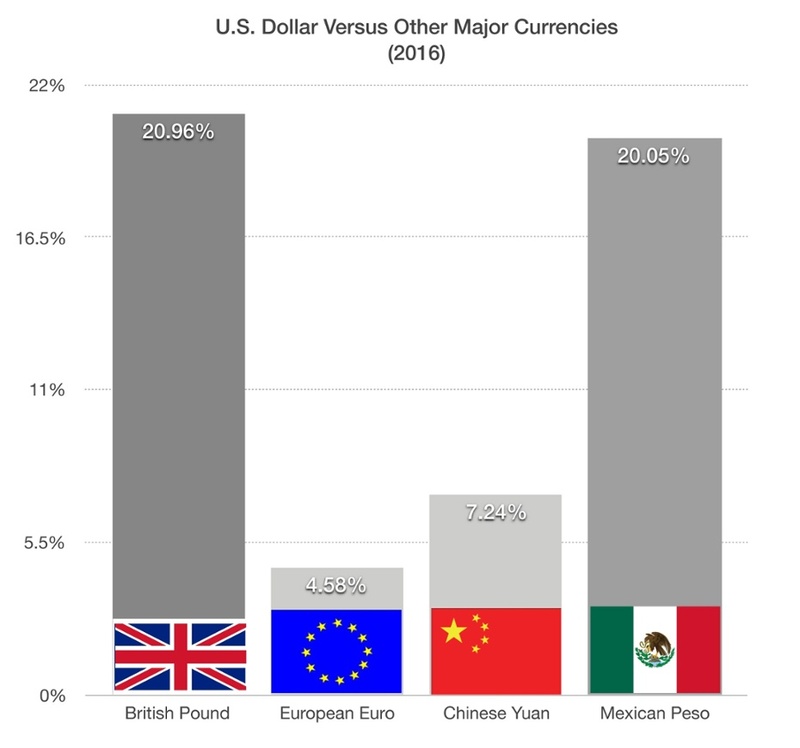 The dollar is up over 20% versus the Mexican peso, 4.5% versus the euro, 20% versus the British pound, and up 7.25% versus the Chinese yuan. Continued weakness with the euro has become a focal point with currency markets as the central bank of Europe continued with its stimulus efforts by keeping key rates at historical lows in Europe. The combination of Brexit and ECB stimulus efforts have gradually been adding downward pressure on the euro throughout the year. The ECB commitment to buy government and corporate bonds in Europe has greatly influenced the ultra-low rate environment. A weak euro may bring about inflationary pressures in those countries that rely on imports, while countries relying on exports, such as Germany, could benefit with a weak euro allowing for greater exports and economic activity.